There are few surefire bets when it comes to selections in the MLS SuperDraft. 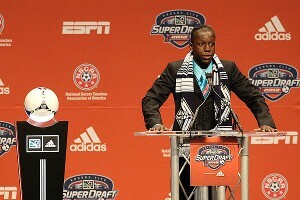 Heading into the 2012 SuperDraft, many observers expected a flurry of deals, and for the headliners of Darren Mattocks or Andrew Wenger to go in the top few picks. That was about all that played out according to speculation, as no trades went down during the draft. It didn't take long for the entire process to wrap up out in Kansas City, especially when compared to past iterations. Here's a look at how different folks fared on draft day. Jamie Squire/Getty Images MLS commissioner Don Garber greets Chandler Hoffman, who was selected as the 13th pick of the 2012 SuperDraft by the Philadelphia Union. In the team's short history, Philadelphia has managed to put together solid outings on draft day. This year was no different, as the team landed three players who can contribute. The Union landed striker Chandler Hoffman (UCLA) in the first round, as other sides passed on the Generation adidas forward. It's in the second round where the club's scouting knowledge paid off. Greg Jordan (Creighton) is perhaps the pick of the lot in defensive midfield. He's a player who embraces his role positioned in front of the back line, and he can find teammates with his excellent passing ability. The pickup of Ray Gaddis (West Virginia) might have been the best of the lot, as he's an athletic right back who gets up and down the field very well. The Whitecaps can thank Canadian counterparts Montreal for letting Darren Mattocks (Akron) fall to them at No. 2. Mattocks comes from humble beginnings, and could be an electrifying addition to both the league and to Vancouver. The second-round pick of Chris Estridge (Indiana) was also astute. After a poor combine performance, Estridge fell out of the first round. He's a recently converted outside back who can play both sides, giving Vancouver valuable depth in defense. Bruce Arena continued to find a way to make things work in the draft, despite picking dead last in both rounds. With Juninho back in Brazil and Omar Gonzalez sidelined with an ACL injury picked up while training in Germany, L.A. had holes to fill. And Arena went out and addressed that with his two selections -- first grabbing Tommy Meyer (Indiana), a central defender with good size, and Kenney Walker (Louisville). Walker in particular seems to be the kind of player Arena loves: He's hard-working, will do the dirty work, and is a proven winner. 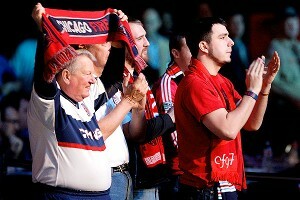 Jamie Squire/Getty Images Chicago Fire fans at the SuperDraft saw their favorite team make three selections, including highly-regarded players Austin Berry and Hunter Jumper. Three draft picks are difficult to get right, but the Fire made impressive moves with each of their selections. First rounder Austin Berry (Louisville) is ready to make a splash in the pros and adds to Chicago's depth. Forward Lucky Mkosana (Dartmouth) needs to work on his finishing, but his speed is going to be a nice complement to fellow Fire attackers Patrick Nyarko and Dominic Oduro. The club then rounded things off nicely by going out and getting Hunter Jumper (Virginia), who not only has the best name in the combine, but could be groomed into a solid left back at the pro level. It's hard to end up in this position with only a single draft pick, but thanks to the teams in front of them, FC Dallas landed a possible replacement for George John in defender Matt Hedges (North Carolina). A decent enough athlete with good size, if John's loan move to West Ham turns into a full transfer later this year, Schellas Hyndman will already have a ready-made replacement in place in Hedges. Make no mistake; selecting Andrew Wenger (Duke) with the first overall pick was a smart move. The Duke forward/midfielder/defender looks like a bona fide prospect, and can help the Impact right away in its expansion season. What lands the Impact in this category is the decision to pass on Mattocks. While Mattocks might not have done as much in 2012, the Jamaican looks to have the tools to be a special talent for years to come. It's hard to pass on a possible prospect like that, even for a player of Wenger's caliber. Currently completing a roster overhaul, San Jose could have made several moves. 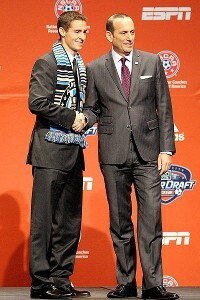 However, drafting Sam Garza (UC Santa Barbara) in the first round was something of a surprise. It's not that Garza isn't a quality player, but that the team had already made moves for wingers, bringing in Shea Salinas and Marvin Chavez during the offseason. Jamie Squire/Getty Images Forward Darren Mattocks, chosen second overall by Vancouver, will bring his exciting pace to the MLS in the 2012 season. Midfielder Jacob Hustedt (San Jose) has a chance to make the team and add midfield depth, but the selection of goalkeeper Chris Blais (South Florida) -- one year after landing 'keeper David Bingham in a lottery process -- in the second round was also a puzzling move. Before the draft season hit full swing, MLS invited a number of internationals from around the world to try and impress at this year's combine. While they were all far from household names -- the likes of Aldo Paniagua (Paraguay), Jason Banton (England), Gienir García (Mexico) and Kohei Yamada (Japan), to name a few -- none were selected in the two-round draft. It doesn't come as a big surprise -- after all, it's a lot harder to see these players brought in for the combine, and teams are already going out on a limb by picking unproven college players as it is. Needing defensive backup, the Timbers elected for a defender with more upside in Andrew Jean-Baptiste (Connecticut) over the defenders more ready to handle the rigors of the pro ranks, such as Hedges or Berry. His age and Generation adidas status does bring salary cap relief and the time to groom, but Jean-Baptiste will need a couple of years to fine-tune some of his shortcomings. Grabbing Brendan King (Notre Dame) in the second round wasn't that much better. Other, more refined midfield options were out there, which included Greg Jordan, Kevan George or Warren Creavalle. There's no doubting the talent of midfielder Enzo Martinez (North Carolina), who should be able to reach his full potential in a place like Salt Lake. It's the second round that was confounding. Left back Diogo de Almeida (Southern Methodist) seems like a bit of a head scratcher . While RSL needs help at the outside back spots, a more logical option like Hunter Jumper was available in the second round. And while it's hard to be critical about grabbing Sebastian Velasquez (Spartanburg Methodist), there's little doubt either second-round selection would have been taken in the supplemental draft. Can the NASL contain the Cosmos?